Please note - I am not a kayak instructor and the journeys described are not for the ill prepared. 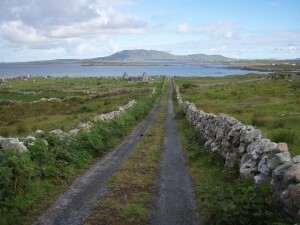 The type of paddling that I take most pleasure in, and is reflected in these accounts, involves exploring the coastline and islands around Connemara on the western shore of Ireland. I also enjoy the thrill of catching the surge of the swell and jumping rocks (but only in my plastic boat). Unfortunately, there is little surf to be found in the area except in periods of stormy weather. The descriptions of paddling routes is confined for the most part to short routes, which take less than a paddle day, and much of the navigation done is by line of sight. However, a deck mounted and handheld compass are essential kit to have in the event of fog or mist. MacDara’s Island viewed from the ruins (foreground) of a signal house thought to have been constructed during Napoleon’s reign (circa 1815). The natural landing point of the island is at the eastern (left side of picture) sandy beach close to the renovated early Christian chapel of Saint Macdara. 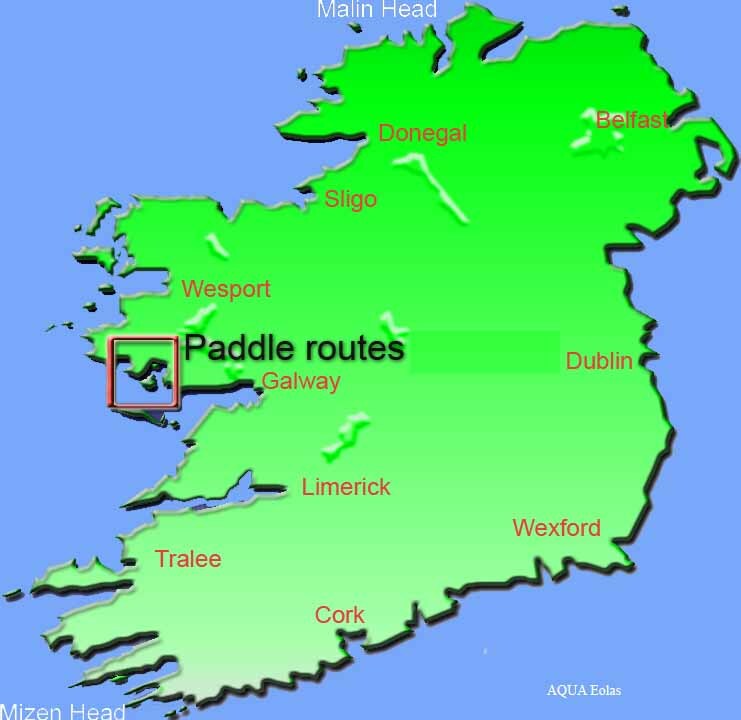 For this outing, us average paddlers should allow about three hours for the round trip including some leisurely exploration and a snack on Oileán Mhic Dara. The paddle time from Moyrus beach to Macdara island takes about an hour for the 5.7 km trip (the round trip is 11.4 km). For the journeyman paddler, the joy of leaving from picturesque Moyrus is the space for parking and proximity to the sea, which more than outweigh’s the slight intermittent inconvenience of a potentially long portage (or drag) along the beach during a spring tide low. Also, please note as parking is near the Moyrus grave yard, park considerately in case of a funeral taking place (which typically occur around 1 pm) and vehicles should not block access to the beach. The main approach road to the car park is narrow, suitable only for one car and the local etiquette appears to be for those driving up the hill away from the beach to give way to oncoming traffic and reverse back to the main car park (note – this is not a hard and fast rule). Have patience. The bohereen down to the car park and Moyrus strand. The nearly white strand of Moyrus is a very gently sloping shore interspersed with an occasional rock and surrounded by a variety of historic sites. 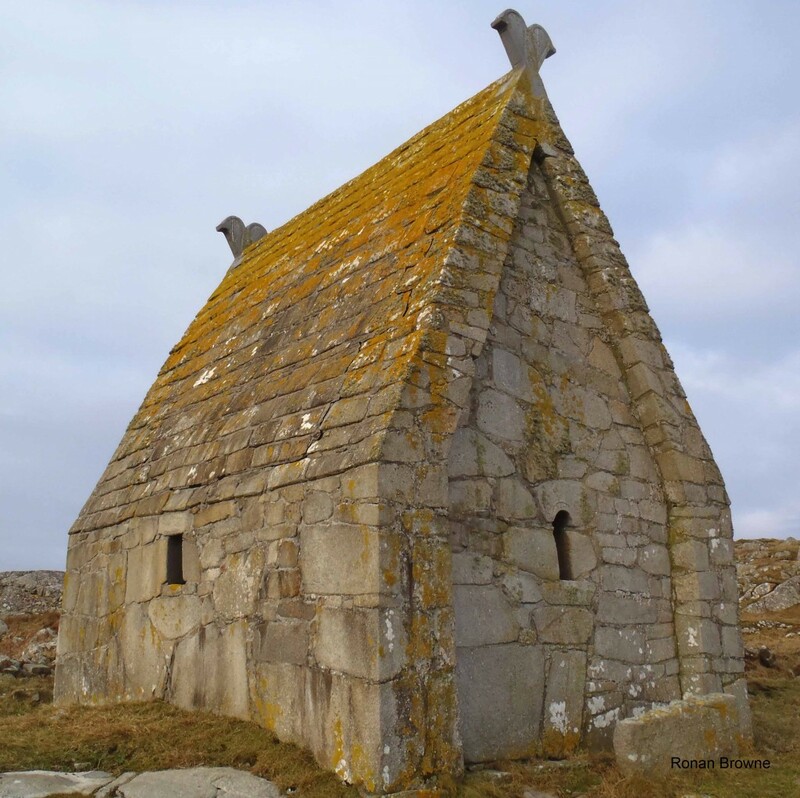 These include the derelict remains of a Protestant church, unusual for these parts established in the 1800’s and a long derelict Catholic Church thought to have its origin from the early Christian period. The beach is lovely for a dip with the tide in, and, when the tide is out there is a great swath of sea grass (Zostera) to be seen. Keep an eye out for the diminutive cuttlefish in the summer and other interesting creatures living among the dark green leaves. 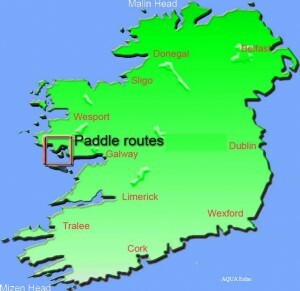 The paddle from Moyrus beach to Saint Macdara’s island while not a great distance by sea kayaking standards, has the potential to be challenging and should not be taken lightly at any time of the year. Groups considering this passage ought to consist of at least three people which are adequately trained/ experienced and have undertaken a serious appraisal of the sea state and given due consideration to weather conditions. Notification of their travel plans and expected return time to others is a given. This paddle route from Moyrus to MacDara’s is somewhat exposed to the fetch of the Atlantic, this combined with often submerged rocky reefs and limited opportunities to safely make landfall can combine to create potentially hazardous paddling conditions. As with any passage, a wary eye should be kept for other passing vessels between the mainland and the island. However, on a calm day you will probably wonder what all the fuss is that I am writing is about. NUIG’s atmospheric research station at An Más / Mace Head. There are the large swells (which can break) that may be present even at times of relative calm around the headland of Mace which is land marked by NUI Galway’s atmospheric research station (www.nuigalway.ie) with its high scaffold towers cradling a variety of instrumentation. The site at Mace Head was first used in the year 1958 to measure aerosols and its present day research themes cover climate modelling, air quality and climate ecosystems interactions. For those lucky enough to see the location of the research station from the sea they will understand why it was chosen for its promontory location on the western shore of Ireland. An area southeast of Mace Head (Ceann Mása) is also infamous for the wrecking of a Spanish Armada ship in 1588 called the “Conception”. The exact location of which is known as “Duirling na Spáinneach”. There is also a 1940′s Defence Force lockout post on the hilltop (Robinson 2005). 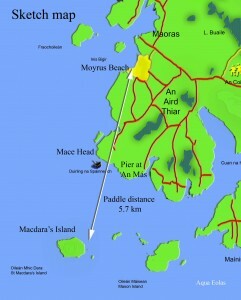 There is an open water paddle of abut 1.5km to the island after rounding Mace Head. At this point you will see Macdara’s Island (60 acres) also called, but not so well known as Cruach na Cara. The landing beach is on the eastern shore of the island and in fair conditions and the profile the iconic chapel nestling just above beach can be seen for quite a distance. St. MacDara was reputedly from Aran and the monastic settlement on the island was reportable established in the 6th century (Previte 2008). The existing chapel may have replaced an earlier wooden structure. St Macdara is the patron saint of South Connemara and the custom was to dip the sails when passing the island. Saint Macdara’s chapel restored 1975. Mass is celebrated on the 16th July and local boats bring out many people to the island. Below is a video of the trip to the island ……………………………………….